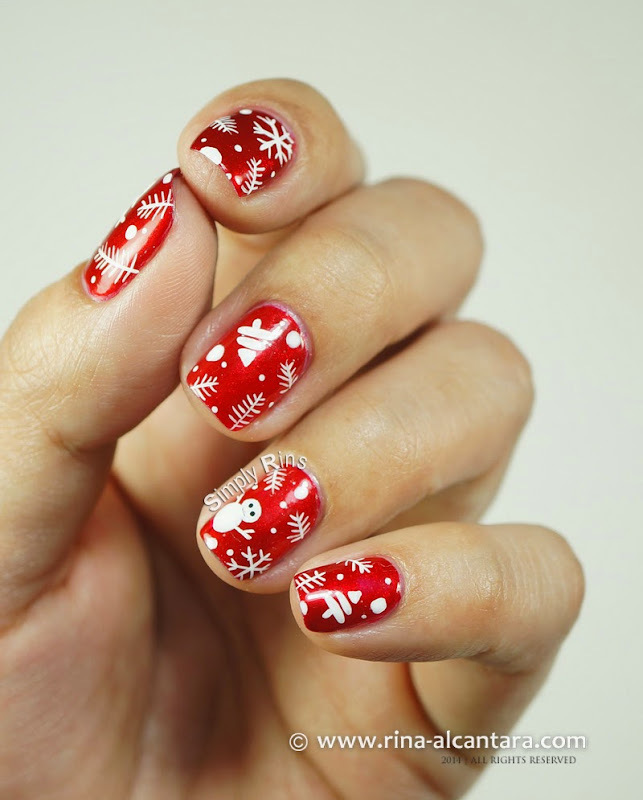 It's 12 days before Christmas and I am slacking on my holiday inspired nail art designs. Crazy things have been happening lately and well, I'm spending a lot of my time with Floozie (my cat) and her 4 kittens which are all growing too fast! And then of course, there was the storm that hit my country last week and the weather was gloomy for several days. But the sun is up, I've got my mood back, and finally had time to do my nails! I used a few Christmas symbols for this wallpaper-like nail art like Christmas tree, Santa hat, snowman, snowflakes, rudolph, and fir tree branches. I painted these randomly on my nails to get that look I was aiming for. For base polish, I decided on 2 coats of OPI Danke-Shiny Red. 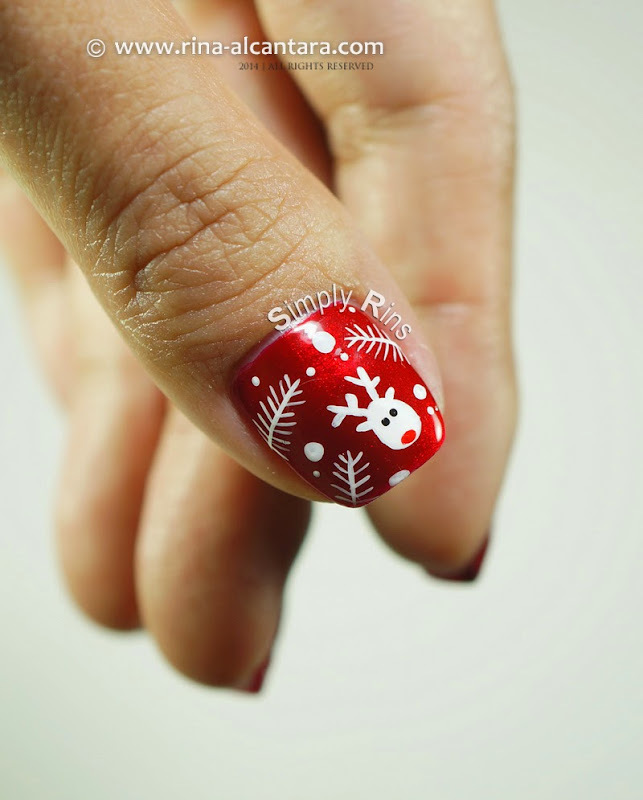 It was the perfect background that added that needed shimmer for this nail art. 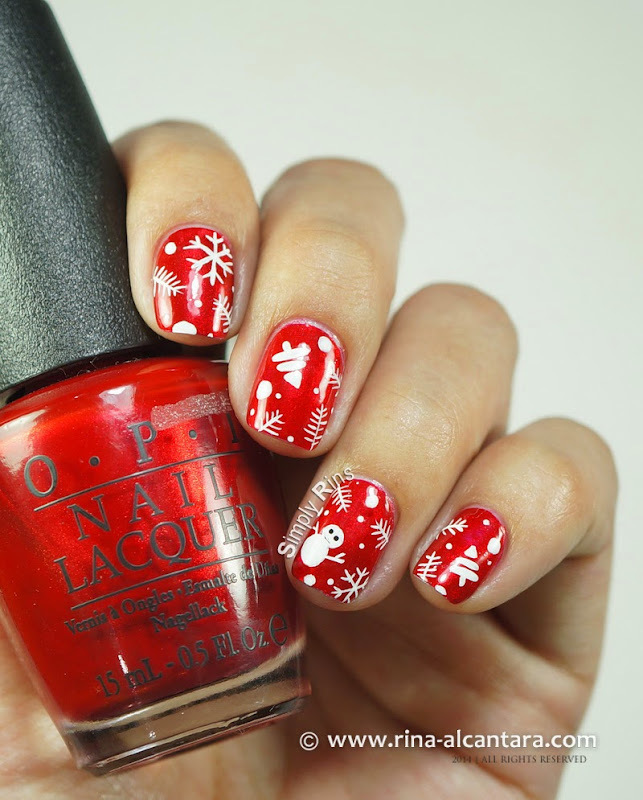 'Painted the design using acrylic paints, a dotting tool, a detail and striper nail art brush. I scattered fir tree branches and dots too for that Christmas-y feel. I initially wanted to just paint snowflakes in place of branches. But the latter was easier to do. I also wanted at first to use blue for background color, but opted for the traditional holiday color instead. This would probably look good on deep purple as well. I know I said that this is relatively easy to do. But to be completely honest, it took me several hours longer painting my nails because there were kittens fighting over who gets to sleep on my lap the entire painting session. It ended when they decided to take shifts! Aren't cats the smartest?! As usual, I'm stunned your design is freehand instead of stamped! Beautiful! This is gorgeous, Rins. I wish I could do freehand designs. I can't believe how wonderful they are, and so neat. I imagine if I tried they'd be all over the nails except where I wanted them. Thanks for sharing with us.